BBC NEWS | UK | Magazine | Belmarsh - Britain's Guantanamo Bay? 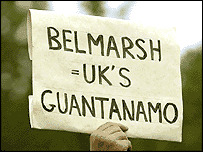 Belmarsh - Britain's Guantanamo Bay? You don't have to go to Cuba to find terror suspects controversially imprisoned. Nine foreigners have been held in London's Belmarsh Prison for almost three years without charge or trial. So is it the UK's Guantanamo Bay? In December 2001 nine foreign nationals were removed from their families by police and taken to Belmarsh Prison in south east London. They have been held there ever since and still do not know why. The detainees are unable to see the intelligence evidence against them and are confined to their cells for up to 22 hours a day. Their solicitors say they have been "entombed in concrete". The men are being held under anti-terror laws bought in following September 11, which allow the home secretary to detain without trial foreign nationals he suspects of terrorism, but cannot deport because it would endanger their life. To date a total of 17 foreigners have been detained, 11 of whom are still being held - mainly in Belmarsh. It has prompted human rights organisations to brand it "a Guantanamo in our own back yard". "The similarities are striking and appalling," says human rights organisation Liberty. "The lack of rights afforded to the men in both places undermines fundamental civil liberties." 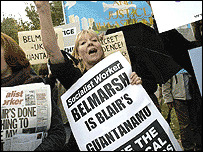 The conditions the detainees are kept under at Belmarsh have been likened to the extreme regime at the US military prison in Cuba, where more than 600 detainees - including four Britons - have been held following the US-led invasion of Afghanistan in 2001. This is something the Home Office has denied, saying the prisoners are being treated well. "The men are held in small cells for 22 hours a day, how is that proper treatment?" says Amnesty International. "We have heard reports of inadequate health care, restricted access to legal advice, to the outside world and to practising their religion. The conditions are cruel, inhuman and degrading. The parallels with Guantanamo Bay are stark." Home Secretary David Blunkett has admitted the situation is not ideal, but says it is necessary. "These were not powers I assumed lightly. I have never pretended that they are ideal, but I firmly believe that they are currently the best and most workable way to address the particular problems we face," he has said in the past. He is also quick to point out that while the men cannot be deported because they face persecution, torture or death in their own countries, they are free to leave the UK "if we can find a country that's prepared to take them". But while campaigners are keen to push the parallels between the plight of the men in each country, they are also highlighting important differences. Public pressure has resulted in the government lobbying the US to give the British inmates in the Cuban prison a fair trial, but there has largely been indifference towards the foreigners held in the UK. "There aren't pictures of the detainees at Belmarsh in fluorescent orange jump suits being led around in manacles, instead they are anonymous, faceless people," says Liberty. "And while Guantanamo Bay is vaguely exotic to the average Briton, Belmarsh is a completely inconspicuous building - even for a prison. "This combination makes it hard to publicise the situation despite the extreme gravity of what is going on. It is easier for people to push the issue aside when they are not faced with such stark images as we have seen from Guantanamo Bay." The legality of the situation is also being reviewed in the US, following a ruling by the Supreme Court that prisoners could challenge their detention. So after being held without trial or access to lawyers for more than two years, detainees are starting to have their cases re-examined by a military tribunal. In the UK just two detainees have so far successfully challenged their detention, with three Court of Appeal judges deciding in August that the government was legally entitled to continue holding 10 other men who appealed. Solicitors are now attempting to overturn the decision in the House of Lords. Liberty says it is "possibly the most important constitutional law case for a lifetime". One it hopes will finally put the plight of the men firmly on the public agenda. "While the government has been seen publicly to lobby the US over the treatment of Guantanamo Britons, it is treating terror suspects the same way in its own country," it says. "Over here it says such action is 'necessary' but no other country in Europe feels the need to go down this path."